Carol-Ann Strudel looked around. Her eyes must off. There was a door and… nothing else. Now she looked not even a wall… or a floor. Weird. She pulled the door open. ‘Wow! That’s…’ she pulled the door back towards her and looked behind it. Still blank. In front there was a beautiful path through the woods. Like the one she and her dad…’ she stifled a sob. As soon as Carol- Ann stepped forward the door… she didn’t know how to describe it. And she was. Even as she determined to stand still her feet kept moving forward. 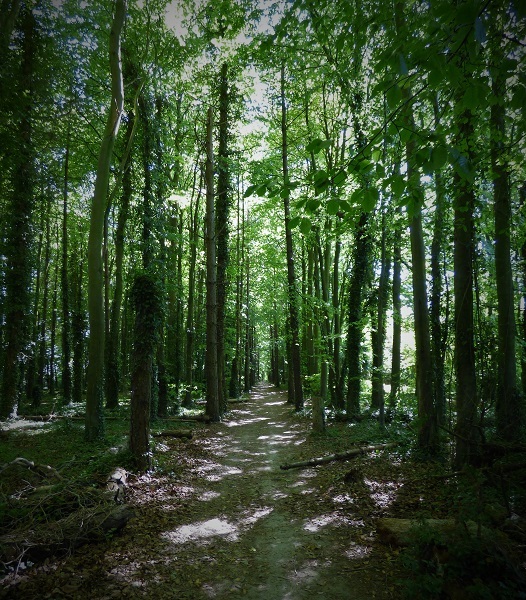 This entry was posted in #writephoto, flash fiction, miscellany, short story and tagged #writephoto, afterlife, flash fiction, short story, woods. Bookmark the permalink. Oh Geoff, this was great! Happy Germination indeed! Ring of Fir by Jonny Ash? One Pine Day by Spruce Springsteen? Geoff, I loved this…So philosophical and reflective. I think it might be poetic justice for some folk to come back as a tree. I can’t understand how some people chop them down so easily without a second thought. I wonder what it would be like to come back as a tree planted in one spot all your life, with some vague notion of being human and not being able to move and yet perhaps living for hundreds of years. So much to think about…Well done. I popped over to let you now the kids’ troop name for Jamboree. After being the Drop Bears last time, they’re going to be the “Bin Chickens” for AJ 2019 to be held in January in Adelaide. I think Carol Anne has a few noodles in her strudel! Happy germination day indeed! A collection of all your mythologies and afterlife stories being found in aeons to come will have the new-earthers scratching their heads about the profound beliefs and experiences of the pre-apocalypse peoples. Your name may well be bandied about along with Heraclitus and Plato – maybe even Euripides. Academics will debate long and hard on was it fact or fiction. Archaeological digs will take place, seeking to find lone doors standing in once forested areas………….. I’m working up a thesis here! This is a stonking good tale. I personally love the idea of being lured to transition and having my life credits checked. My take on the prompt is very different … it took an alternate track. This is exactly how I imagine a conversation with Geoff to go (no, not as the voice of Carol-Ann). The story was very entertaining to read, as usual.
. . . of souls and trees suffering cruel bureaucracies. . .
Well done Geoff! Lots of fun again. No bright white light either. I like the thought of transcending, walking along that path, and hearing the voice of the ‘Milk Tray’ man. I wonder what his favourite centre was?